From 460 turn onto Southgate Dr, take a Left onto Duckpond Dr, turn Left onto Plantation Rd, turn Left at the first fork in the road, and pull into the parking lot. 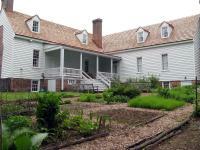 Built on the Virginia frontier in 1774, Smithfield, the elegant, Williamsburg-styled home of William and Susanna Smith Preston, has for over 230 years manifested the American spirit of enterprise and openness to change. The house sits on its original site and boasts a rich Revolutionary War and Civil War heritage. Members of the Preston family became important educators instrumental in the founding of Virginia Tech and VMI. Three of them served as Virginia Governors. Others became important civic and military leaders.